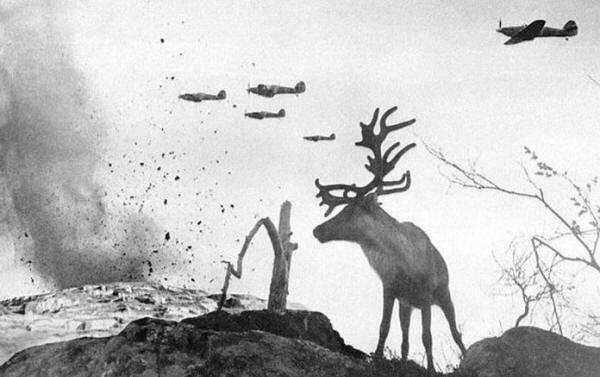 Claim: this is a photo of a shell-shocked reindeer in the middle of a war zone. Planes drop bombs on Russia in 1941 during operation “Renntier” (Reindeer). The claim is mostly false. This photograph by Yevgeny Khaldei is a composite. The planes and explosion were added later. Image credit: Voller Ernst – Ullstein bild / Granger, NYC (1942). More details can be found from a blog post by Dan Conolly.